Veteran mountaineer Kamirita calls for providing social security to Sherpa climbers - Integration Through Media ....! Ramesh Lamsal, CB Adhikari, KATHMANDU: Among tough resolutions of those enjoying adventurous life, climbing Mount Everest and setting a record may be one. The blissful moment of being atop the highest peak of the world is indeed unrivalled occasion in one’s life. But some climbers are quite reverse to this idea that they take it as a household errand. “I’ve been atop the Everest not to keep record but to guide others to scale it. My task is guiding to climbers. I feel it going home and meeting family members,” observes Kamirita Sherpa who climbed the Everest for 22 times so far. Interestingly, he says he does not count how many times reached the pinnacle. According to him, his friends kept the record which makes him happy. Exuding radiance on face, he shared the Everest invites him every year. Kamirita, 48, is from Thame of Solukhumbu district which abodes the Everest. Still three to four years, he wants to continue his job. It was 1994 Kamirita began his life in the high altitude being a porter to the trekkers which led his journey atop the Everest. It was his first time. Since then, it was only one year- 2015, he could not do his errand, otherwise, he is almost assimilated with the snow. In these many years, he has varied experiences; sometimes, he even had to walk stepping on the dead bodies- it was quite harrowing. He reminds that it was 2014 avalanche where 19 climbers including 14 Sherpas lost their lives. “Sometimes a fear of whether the Mount Everest gets angry captures his mind and heart,” but climbing season this time relatively witnessed less losses. Kamirita’s senses the Everest sometimes peaceful and enormous. Growing garbage problem in the Everest riles this regular climber as it seems the Everest has been gradually turning into a dumping site. The scene of used oxygen cylinders, water bottles and materials left by climbers have tarnished the natural beauty of the peak. According to him, guides are those to accompany climbers/submitters to the peak risking their own lives and suffering a lot during the expedition, but his personal experience is such people find it odd to pronounce names of guides and spoke about their contribution to their successful trips. He expects that those who once reached the top of the world to get heavenly experience not to be over selfish in the remaining life and not to forget their Sherpa guides who were with them to the atop without caring for own life. Lhyakpa who is in her mid 40’s is a permanent resident of Shankuwasabha, a district in the province 1 and currently lives in New York of the United States of America. But material comforts available on foreign soil never come to her way to continue with her mission. As she says her heart is inseparably attached with her motherland and nature. Passion and dream of earning new experiences in mountain climbing have worked as a driving force in her case. In every spring season, she arrives in Nepal, chasing her dreams. She is waiting for completing his 10th ascent to the Everest to scale the Mount K2 of Pakistan. In view of both climbers, the Sagarmatha has slightly changed compared to the past. Snowfall has slightly decreased. Garbage level has increased, and immediate interventions are required to control hit. However, the Gokha quake has transformed the nature of Kumbu icefall, beautifying it more. This spring season blessed by the favour of nature and recorded more success than in the past. Growing level of garbage at camp II and camp IV is caused by humans are the concerns of both climbers. Kamirita is popular among the foreign citizens. Some propose for starting a conjugal life with him, some want him to work with them, some desire to write about him and some just want to listen to him. But he is determined to continue his profession for more few years. He has been associated with the Alpine Association since the last 25 years. He worked as a mountain guide for the Association and is now the chief mountain guide. “One should not betray one’s employer who has supported to provide for the family and for the education of one’s children,” he said. He is thinking of continuing his profession for some time. “I have everything. I have no shortage of anything,” said the veteran mountain guide on a hopeful note. Kamirita who has weathered all storms in life in his 27 years as a mountaineer is concerned for lack of protection of the Sherpas. Tenzing Norgey Sherpa and Edmund Hillary made history by scaling the world’s highest peak for the first time in 1953. But the fact is it is not possible to reach the summit without the assistance of the Sherpas, whoever reaches atop the Mt Everest. No matter whatever records have been set regarding climbing Mt Everest, no mountaineer has done without the invaluable support of the Sherpas. 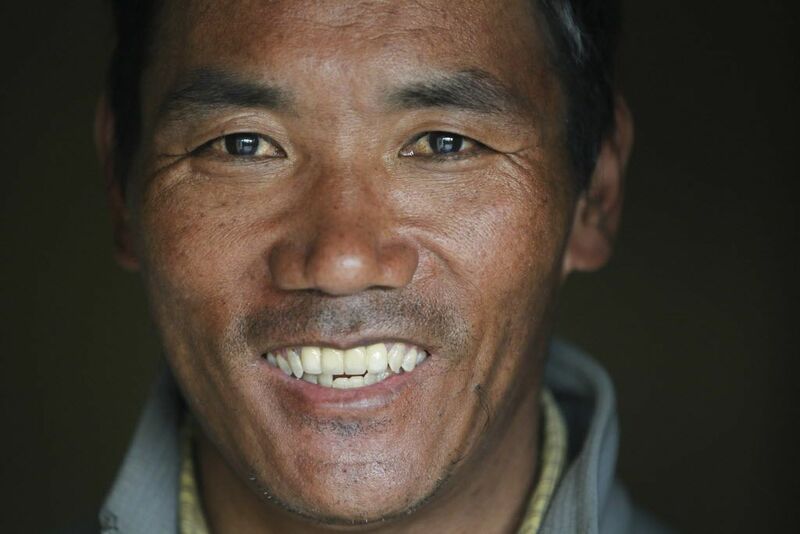 However, the work of the Sherpa mountain guides who assist the mountaineers doing all kinds of chores like cooking for them, preparing their bedding and overseeing that they have taken their food and also assisting them during difficult ascents by giving them a hand, has not been well-recognised, rues Kamirita. “The mountaineers get name and fame. What about those Sherpa assistants who work for them putting own life at great risk,” he asked. He said this is because of the weakness on the part of the state. He wishes the mountaineer or company concerned take the name of their Sherpa assistants on their successes. According to Kmairita, there are many Sherpas who have climbed Mt Everest for 11th or 12th time and the state should make provisions for supporting them. He said it is the Sherpas who have contributed to promoting tourism and especially mountaineering in the country but they are always in the shadow. “Tenzing Sherpa is our great grandfather. We are into this profession from the time of our great grandfather. The Sherpas of my generation are continuing this profession but the new generation Sherpas would not climb Everest many times like us. Even if they do they would quit the profession after getting name. So, the government should give special protection to the Sherpas,” he shared. Giving example from India, he said, “The Indian government has provision for providing special allowances if a person climbs mountain one time.” He added that there are many Sherpas in Nepal who have climbed Mt Everest many times- from the 10th time to the 22md time. What is the state thinking about their future, he asked. Kamirita warns that it would be difficult to find Sherpa mountaineering guides 10 years from now if the government did not pay attention for their social security ending the many anomalies in the mountaineering sector. Another mountaineer Lhakpa Sherpa seconded Kamirita.